Pippi Hornsby: Computer as the Creator: Looking into A.I. Computer as the Creator: Looking into A.I. Part of the Anticipating Change project research, taken from my minutes from the group meeting on 13/10/14. The meeting revolved mostly around the concept of A.I. (Artificial Intelligence), its definition and how and where it’s used. The working title of the presentation was “Computers as the Creator”. Artificial Intelligence is defined by the Turing test (devised by Allen Turing, the father of modern computer science – and a Mancunian) as the machine's ability to exhibit intelligent behaviour equivalent to, or indistinguishable from, that of a human. The capabilities of a computer that mean it truly has artificial intelligence are: Pattern recognition, understanding, learning, communication, and reasoning. If a computer has all of these things, it is classed as having A.I. There are no computers at the moment that are classed as having A.I. That being said, there are many examples of computer systems and algorithms that use one of the qualities listed above. 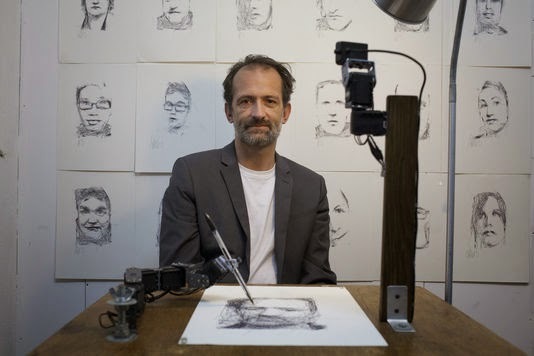 Drawing and painting robots (AARON, e-David, The Painting Fool, and Paul) all use imitation to produce novel outputs – they take a photograph of something that is put in front of them and turn that into a stylised image, most often using a robot arm output. The systems that work in these examples are feedback loops, so are fairly simplistic and do not use any of the A.I. qualities. There are a few examples of algorithms that adapt during use and show one or two of the different quantifiable features of A.I. Angelina is a video game storytelling function that tracks a players interaction and the choices they make throughout a game and adapts the ending based on their inputs. This is unique in video game storytelling, as the majority of games allow players story arcs to split at defined points and come to a pre-determined ending, where as this adapts the story as you go along. IAMUS is a musical software piece that can compose its own music, with only access to your digital music library. It requires no specific user input. This utilises the idea of pattern recognition – picking up common musical patterns and splicing them to form new tunes. Shimon is also music-based software, but this time an app that can take part in jazz improvisation. [James tells us that it’s not actually very good at it, but the concept is great]. This would probably be classified as pattern recognition and learning. Creativity is complex and needs to be quantified to be written algorithmically – this is the concept of the Turing test. Computers are plastic by nature, the way in which we write software is feedback lead and so the majority of drawing robots are simply mimicking what they are inputted into a style (very much like the filters in Photoshop) and outputting it through a robot arm to make it look creative, when actually it’s not. At present there are nearly 22,000 organisations with dedicated research into A.I., which is a 500% increase from 1996. Arguably, there wouldn’t have been any drive for A.I. research in 1996, so that statistic could be skewed, but what is the interest like now? Is it still growing as a research area as fast as it was? Or is it now becoming stale as we move in other directions? It is part of human nature to try to make our everyday lives easier by using technology. Whether it was the first use of domestic crops for farming, or weapons for hunting, we always strive for an easier life. Modern technology is still viewed as a tool to make life easier, and has been developed to be more intuitive (Apples iPad touch gestures). Could we harness the pattern recognition software to get computers to trend-spot and produce our perfect on-trend item without any user input? Is this already being done without our knowledge? During this meeting we spoke at length about A.I. and how it is defined, and we did stray off our topic of design quite considerably. One of the problems that we had was that I didn't introduce the Turing Test until quite late on. Because the Turing Test is seen by the science world as the ultimate definition of "what is A.I?" we spent a lot of time debating the nuances around how we define thought and creativity, and if such things as inspiration were possible without having lived a life and gained experience, and so went round in circles a bit. When I came to write up the minutes I decided to be more factual about it so we could cut to the chase for the part-time students in our group. I have done a fair amount of computer programming as part of my undergraduate degree and so felt quite knowledgeable on the subject. I realise now that I could have come across as a bit arrogant, and though I wasn't trying to squash any philosophical debate, my aim was to get back to the point of the project which was to investigate the key aspects of design. I actually missed the next meeting but it seems that the group managed to pull the topic back a bit so we ended up very much on track (we hope - the presentation is tomorrow). All that being said, it was fascinating to hear such in depth debate on the ethics of advancing technology and what we believe to be possible, and I have now vowed to record future discussions to listen back to so I can really absorb all the points being said - just as the group project is finishing!